Mon, Apr 8, 2019, 10:32 pm SL Time, ColomboPage News Desk, Sri Lanka. 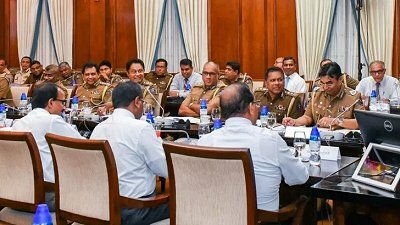 Apr 08, Colombo: President Maithripala Sirisena held a discussion with senior police officers today (April 8) at the President's Office to discuss the progress of the implementation process of the proposals to solve the issues pertaining to junior level personnel of the Police department. Measures measure required to improve facilities at Police Hospital at Narahenpita were also discussed at the meeting. The President instructed to purchase the vacant land belonged to the Urban Development Authority for expansion of the hospital.